Scarecrows. They come in all shapes and sizes, but they all have one goal: scare away the crows. But some scarecrows get a little carried away and end up scaring more than just birds. While some of the most simplistic scarecrows are just made of wooden poles and straw, some of them go above and beyond with full facial features and scary weapons to ward off the pesky vermin in their field. 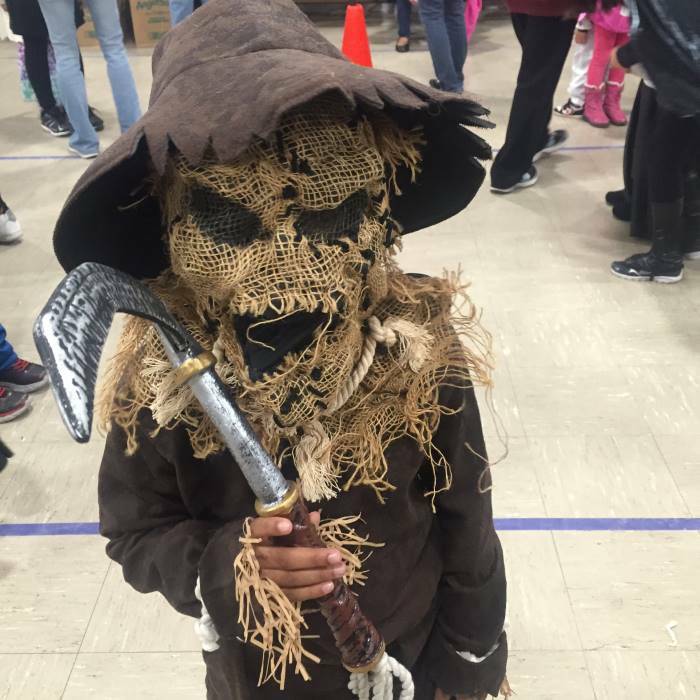 This child scarecrow costume is perfect for a scary Halloween costume. This costume comes with everything your child needs to terrify the neighbors. The pullover shirt has a jagged hemline and cuffs with straw-colored fringe and is a burlap style fabric. 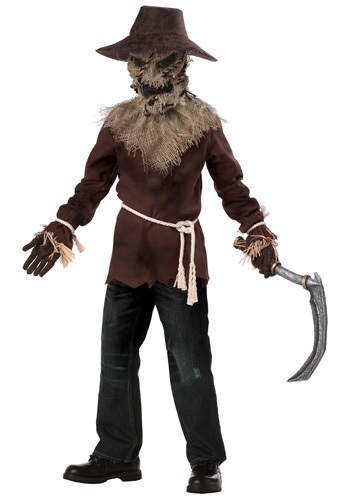 To give it a true scarecrow look, the costume comes with a 6’ long rope that ties around the waist as well as two shorter ropes for the wrists. The scary mask is molded latex covered with burlap and it secures with an elastic band around the back of the head. Finally, the polyfoam hat with jagged brim and faux suede gloves give it the final details it needs to come to life. But, let’s not forget about the terrifying part – it comes with a plastic toy scythe that is sure to scare more than crows away this Halloween! I bought this costume for my son and I absolutely loved it. He received so many compliments. He definitely had the best costume in our neighborhood. I ordered this costume for my 6 year old son. It fit him perfectly so if your wanting a size 7-8, definitely order up. The mask was horrible. I tried using a hair dryer per the instructions but could never get the wrinkles out. The fit of the mask was horrible, it didn't even fit me. So, he never even wore the mask which was what made the costume. I was very disappointed as a cheap mask found at the local Walmart fit better. He was very disappointed in the Scythe as it was just cheap foam. We ended up going to Walmart to get him a plastic one. So basically, he used the shirt and the hat. Bought this for my son for Halloween because this is what he wanted! It's pretty cool, and he seemed to be very pleased with what he has picked out this year for his costume! We always order from Halloween Costumes, and we are always happy customers! All items look great but definitely order up because they run really small. I mean really really small. This outfit could have been awesome but the material had such a bad odor to it that it was unreal..We tried spraying it down with febreeze but as soon as my son got to school apparently the febreeze was overrode by the awful smell. My son was totally embarrassed by the kids making fun of him and had to take it off. Now the smell is in his bookbag that I can't get out.